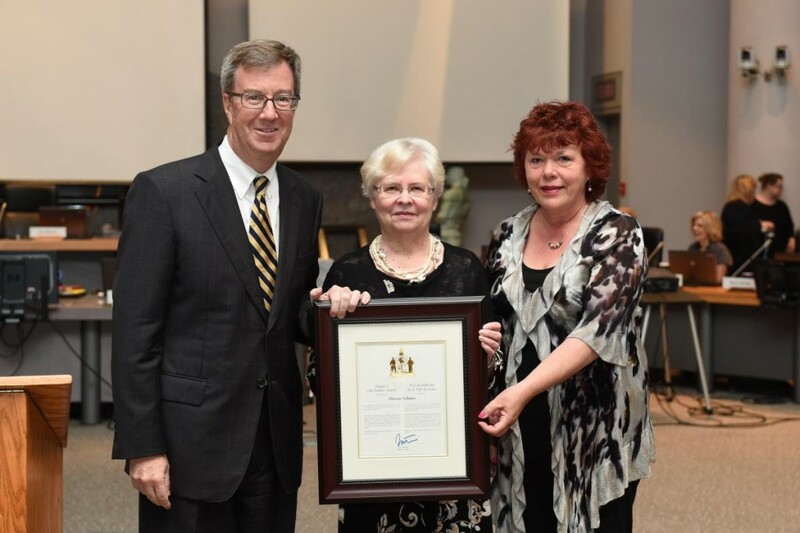 Mayor Jim Watson and Councillor Jan Harder presented the Mayor’s City Builder Award to Mrs. Doreen Lebano today for her outstanding contributions to public health as the event founder for the Barrhaven Lions Club’s annual Mother & Daughter Gala Dinner, which raises funds for cancer patient care at the Queensway Carleton Hospital (QCH). Doreen is a 24-year survivor of breast cancer and an 11-year survivor of a rare blood disorder called Thrombotic Thrombocytopenic Purpura (TTP). During the long hours of her treatments for TTP, Doreen’s daughter, Angela, would keep her company. Doreen enjoyed the quiet one-on-one time with her daughter and found it aided in her recovery. When she was healthy again, she decided to organize a fundraising event for the QCH. Her daughter suggested a mother-and-daughter gala dinner, and Doreen, a long-time member of the Barrhaven Lions, decided the Lions Club would be an excellent organization to host the gala. The Mother & Daughter Gala has been held every May for the past ten years. Doreen is the lead organizer and she has spent countless hours seeking sponsorships. To date, the gala event has raised over $100,000 for cancer patient care at the QCH. Recently, a patient counselling room in the Irving Greenberg Family Cancer Centre was dedicated to the Barrhaven Lions Club Mother & Daughter Gala in recognition of their support. Doreen also volunteers for many other community fundraising efforts by the Barrhaven Lions Club, as well as working at the Jerry Lewis Telethon for the past 12 years, and Barrhaven Fun Day on Labour Day weekend for the past 18 years. She has received two prestigious awards from Lions Club International: the Melvin Jones Fellowship Award and the Helen Keller Award.